Disunity in the mass working class movement only ever has one beneficiary: management. As we can see in the split in Cosatu, that includes the neoliberal government. Over the last few months, five Amcu leaders have died at the hands of assassins. We have noted the relative silence of the media and government about these deaths, compared with their response to the political killings in KwaZulu-Natal. The identities of the assassins may be unknown. But it’s clear who benefits. The killings take place at a very particular time in the life of the mining industry. Ten years after the global financial crisis started, South Africa’s mining industry has sunk from the super profits of the 2000s. Commodity prices are low, and the failure to restructure the economy away from its dependence on extraction has left the economy acutely vulnerable. The mining industry lost 70,000 jobs in the last five years. Another 20,000 jobs are reported to be on the line at Sibanye Gold, AngloGold Ashanti and Bokoni Platinum. What better time, from the bosses’ point of view, to have trade unions and workers at each other’s throats? “We wonder whether a new campaign is being unleashed by the state and its allies against our militant and independent union…We wonder if this is a continuation of the dirty tricks campaign led by President Jacob Zuma and the National Intelligence Agency, which sponsored the building of an opposition union aimed at defeating Amcu”. He is referring to the Workers Association Union, launched in 2014, on Zuma’s instruction. We hear plenty of rhetorical calls for unity in the labour movement. “Unity is paramount”, “Unity is sacrosanct”. Too often the unity being talked about is the unity within a single union, or the unity of a federation. In the dust of factional battles, we lose sight of the imperative of the broader working class. 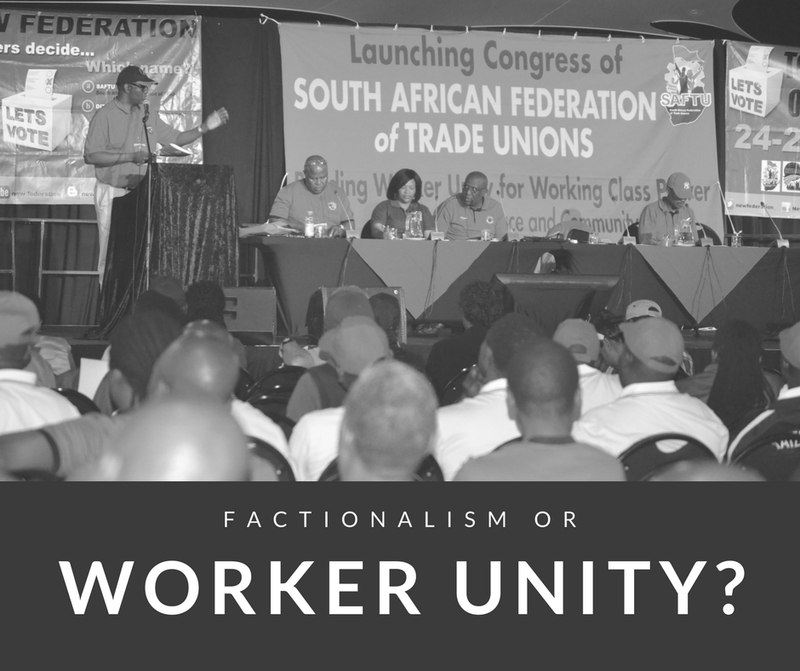 Right now, the imperative is that all the unions in the mining industry genuinely and actively combine around practical programmes to eradicate inter-union factional killings. The unions together must wage war on the assassins and their factional material interests. They must join together to demand that employers provide protection to workers where they live, lest this escalate into a cycle of killings and counter-killings that will be very difficult to stop. Management must be as concerned about workers’ health and safety above ground as they claim (falsely) to be under ground. The reason for this call is not a rhetorical one. It is very practical. Only workers who are united around a clear set of demands and a clear strategy can hope to fight successfully to save jobs in the midst of the current jobs bloodbath. Neither Num, nor Amcu, nor Numsa can do that job effectively on their own. And the employers know it. Of course, unions and federations can look backwards at the splits and expulsions of the past and see more than enough reasons for continued separation and division. Vicious, inflammatory words were used. 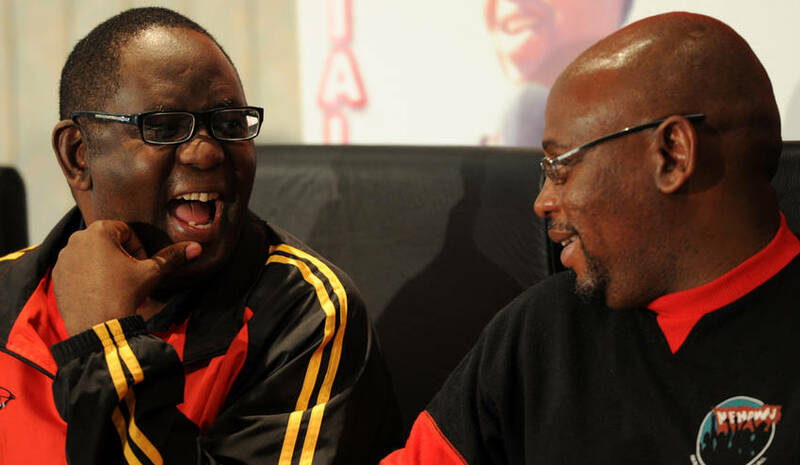 Cosatu leadership behaved as a faction when it expelled Numsa from its ranks. We will always condemn such wilful division of mass organisations of the working class, for factional “gain”. Those historical reasons will never disappear. But responsible, class conscious trade union leaders must be capable of seeing beyond factions to the interests of workers and the poor as a whole. “The strike’s main demands are “to push the President of the Republic of South Africa Cde Jacob Zuma to establish the Judicial Commission of Inquiry” and that “the state and all its institutions must refuse to deal with the predatory elite and in particular cancel all commercial dealings with the Gupta family”. But nevertheless Saftu “cannot support this march”. Firstly, Saftu was not consulted. We have no fundamental argument with Saftu on this. It would have been proper for Cosatu to consult the other federations with a view to a joint action. They didn’t. But we know their factional history well. It’s not a surprise. The disappointment in Saftu’s position does not rest there. Their reasons comprise a litany of Cosatu leadership’s major sins over the last few years: abandoning the programme of Cosatu’s 12th Congress, opportunistically picking up the issue of corruption having justified it for years, striking against a government whose election it supported etc. All sins properly recorded and absolutely true. But what is it saying? We can’t collaborate with you because you have behaved consistently badly in the past? What about the many thousands of ordinary workers who responded to the call to stay away and march? Surely we want to build unity in action with these workers – despite their rotten leaders. And what would the state of Saftu be if all the unions which are opposed to Cosatu’s alliance with the ANC said we cannot work with Vavi or Jim for their past sins of supporting Zuma? What prospects for Numsa’s workers party if the left who never supported the Zuma project said we cannot link up with them because their leaders were uncritical of the SACP, which the workers party is now supposed to challenge? We recognise that it was not long ago that Cosatu leadership condemned Numsa for speaking out against corruption and calling for Zuma to go. Now it has a march in favour of those very same demands. That must be hard for Numsa and Saftu to stomach. 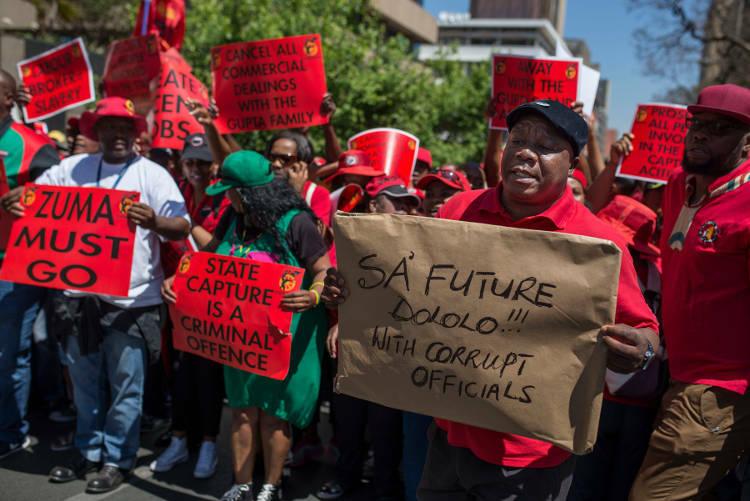 But then it was not long before that that Numsa also changed its position, from one of vigorously supporting Zuma’s campaign for the Presidency, despite clear warnings of what would come. It would be surprising if Numsa found it easy to cooperate with Cosatu. The offences for which Numsa was “surgically removed” have now become the new “policy”. Add to the mix, rivalry between the SACP (Cosatu’s ally) and Numsa’s Workers Party and there is strong potential for a divided and weakened labour movement. It would be equally surprising if Zwelinzima Vavi would find it comfortable sitting in a strategic meeting with S’dumo Dlamini. But that does not mean he should not be there. How can we argue for a multi-class United Front, if we can’t create a working class united front? The strategy of the united front was developed precisely for such situations. We don’t have to like each other, or forgive sins of the past, to organise, for example, a joint campaign of all federations around defence of jobs and opposition to corruption. A joint campaign does not prejudice the federations’ freedom in all other areas. But it shows the employers and their political representatives that we can stand together when our interests are threatened. This approach should be reflected at industry level as well – whatever we do separately, we must stand together against the employers. “Rent-seeking networks” fundamentally get their “rent” from extractive industries. In Venezuela, it is oil. In South Africa, it is a range of minerals including gold, platinum and coal. These “rent-seeking networks” benefit from the profits of mining. They are having their own factional battle now, inside the ANC. On the one side, the first generation of corporate-connected black elite: Cyril Ramaphosa and Tokyo Sexwale. Much more connected to the traditional white ruling class as well as transnational capital. On the other side, the newer layer of the Zupta predatory elite. Capitalists who don’t enjoy such strong connections with the corporate economy. Reliant instead on the ever-burgeoning procurement spend of the state, which now comprises 42% of the total public budget (R5 trillion – R5,000,000,000,000). But they all benefit from the same extractive industry and therefore from divisions in the organisation of workers. In the 80s and 90s, first in KwaZulu-Natal and then on the East Rand, the state expressed an interest in fomenting discord amongst the black working class. The state today has a similar interest. Who is to say that the Third Force is a thing of the past? The only protection for organisations of the working class against such attacks is the united action of its mass organisations. Otherwise those organisations will be successfully pitted against one another. The price for the working class and the poor will be high.